I recently purchased a 2013 Chateau 22E with a Sirius ready Jensen radio. Has anyone figured out how to acquire Sirius or SiriusXM for under $50? I ordered an antenna/tuner kit but it will only work on XM. The 8 pin connectors are not compatible. The recommended kit from Jensen is over $300. It would make sense that there is an adapter for the connectors. I think one is 8 pin din and the other is an 8 pin din. Not sure what tuner you need. If you let us know which one you need, maybe someone has it. Never hurts to ask. If you have the Jensen 215 you can use a SiriusXM All access account and your smartphone: Simply bluetooth the audio from the app to the radio. Granted this will only work with cellular or WiFi coverage but it costs almost nothing (if you already have the SiriusXM account). When I searched around for something similar I had discovered that most of the satellite modules that would plug in are discontinued. You may be better off simply replacing the radio with something better. 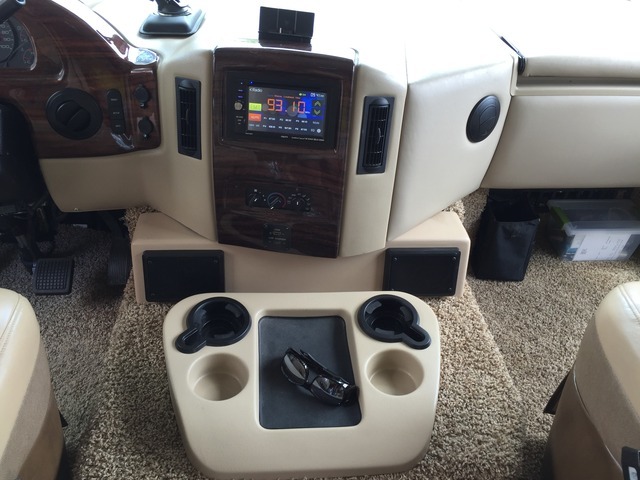 This is what we've done, so we don't really have to deal with the radio & adding a receiver behind the dash. Above the radio there's a docking station that we can move from one of our cars to the rig when we go camping. That way we can enjoy it all the time without having to keep two subscriptions. Below the dash are two additional speakers we had installed. The roof-mounted ones were pitiful. They can be easily unplugged and moved out of the way if we need to get into the doghouse. We've had it in 3 vehicles, they kept going up on the price, reducing programming and moving the channels around so you had to hunt for the programming you liked. It didn't work in Alaska when we were there. When the free subscription on the Wrangler we just bought runs out it won't be renewed. If I were picking up a new subscription today I'd think twice about it. But back in 2008 XM offered a lifetime subscription for $400. I picked up two(!) for both cars. Since then I've sold the cars, but for a small transfer fee I've been able to keep the lifetime subscriptions. One of the best decisions I ever made. I really love satellite radio and can't imagine my cars -- or RV -- without it. As I tell them each time - if they offered a truly portable subscription (not cell phone app) - that I could use in any of my vehicles... I would buy the extra receiver AND pay the full price subscription... but I'm not carrying multiple subscriptions when I'm only in one vehicle at a time. I do it the same way you do. I get a 5 -6 month subscription for the motorhome for those times that I know I will use the rig, and cancel it after wards. I don't need it for my car because it has digital radio possibility and I get enough stations I like for free. If Sirius/XM would allow me to switch between my car and the motorhome, I might consider a full subscription. This is exactly what we have done (even put the portable in the same spot) And you can get a new one on eBay for under 25.00. Works great, and when I am not in the RV I use it in my office, since I am not ever in the RV and my office at the same time. Doesn't feel like I am wasting money, and I love satellite rsdio on the road. I bought an Onyx Plus with auto adapter and an extra home adapter. I use it in the office when the RV is parked. If you are a new subscriber they have two radios that are free right now. You can also get an extra auto adapter if that is what you need. I think I pay something like $15 a month but I use it five days a week. My car radio and my motorhome radio have Sirius receivers build in. I do not want to put another receiver unit on top of my dash (specifically not in my car) and I would not know where else I can put one of those things and still be able to operate them. At one time, I had Sirius/XM in three different vehicles...and the cost just got completely out of hand. Now I just bluetooth from my phone to the vehicle radio. I listen to Spotify for music, either of the links below for old time radio, and stream Fox, CNN, or ESPN from their websites. I just purchase a little extra data on my cell phone plan to cover streaming, but it is still a LOT cheaper than satellite. There is just too much free content that can be streamed to buy it from Sirius/XM. I've determined to forget about the Sirius radio tuner for over $300. I can live without satellite radio and use CDs. Here's my take on the radio. When Sirius and XM merged, Jensen had a surplus of Sirius radios and dumped them in the RV industry and jacked up the price for the tuner. That explains why the Sirius tuner is $300 and the Sirius/XM tuner is $30. They perform the same function but the Sirius radio owners pay extra to activate. Yes, we connected through the rear AUX IN AUDIO on the axxera. Much better than watching a "blue screen" on the radio. Does the rear AUX IN VIDEO consist of the RCA plugins? Yes sir and splitters ( if you need them) work great. We also gat a RCA to 3.9 mm cable and took the camera output into our Garmin RV 760 GPS.